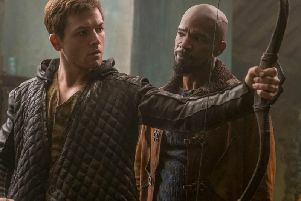 Jamie Dornan admits he’s not a religious or overly political person, but his latest role sees him thrust into a world beset by religious and political tension and upheaval. 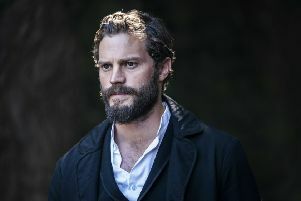 The Northern Ireland actor – most famous for his roles in The Fall and the Fifty Shades movies – will return to the small screen next week in BBC2’s Death And Nightingales – a powerful, gripping drama set in Co Fermanagh in 1885. Dornan stars alongside Matthew Rhys (The Americans, Brothers & Sisters) and Irish actress Ann Skelly (Red Rock, Kissing Candice) in what he describes as “a well crafted and classy drama”. Taking a break from filming scenes in the courtyard of an old country house a few miles outside Downpatrick, Jamie explained how he hadn’t even heard of the novel the drama is based on – Eugene McCabe’s Death And Nightingales – when director Allan Cubitt approached him about taking on the role of Liam Ward. “I probably did that actor thing of pretending I knew the novel really well, saying it was one of my favourites, but I didn’t know of it. Obviously I have read it now and I love it,” he said. The drama – a gripping story of love, betrayal and revenge – follows Beth Winters (Ann Skelly) as she attempts to escape her complex and difficult relationship with her Protestant landowner stepfather Billy (Matthew Rhys) with the aid of the charming Liam – a young Catholic man who hates Billy for his wealth and power. Describing his character as the catalyst for every dramatic event, he said: “It’s always interesting playing characters you don’t instantly have an understanding of who they are and what their intentions are. I like that. I like the idea of playing someone that keeps people guessing. “This part of the world has a very particular history and it has had a massive impact on every single person who has chosen to live here or been born here,” he said. “I think it would be wrong to run away from it. I think it’s very interesting to show many different stories at so many different points of the history of this country. Jamie, who now lives in Gloucestershire, said it was “brilliant” to get the opportunity to return home to Northern Ireland where people understand his accent. “It’s nice not to have to repeat yourself or make a joke that no one gets,” he smiled. • Death And Nightingales is a three-part drama based on Eugene McCabe’s modern Irish classic novel of the same name. Adapted and directed by Allan Cubitt, best known for his work on Prime Suspect 2 and The Fall, it is a riveting story of love, betrayal, deception and revenge, set in the beautiful, haunting countryside of Fermanagh in 1885. It follows a woman’s struggle to control her own destiny and illuminates tensions that tear both families and nations apart. The first episode of Death And Nightingales will air on BBC Two on Wednesday, November 28 at 9pm.